You know you're biking in a strange place when the safest place to be is behind the cyclists hauling canisters of compressed natural gas. 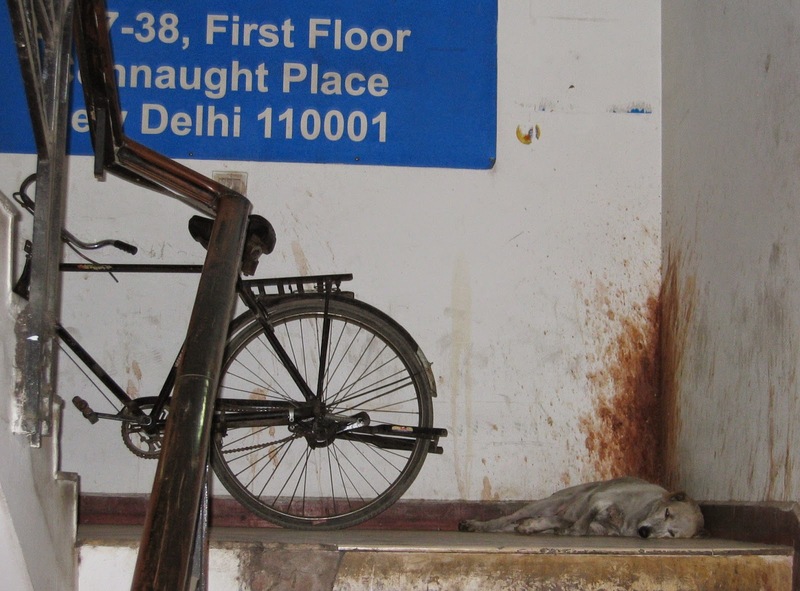 Now, for those of you who may remember: I've been to Delhi and Gurgaon before where I joined a tour group called Delhi by Cycle to ride through Old Delhi and see some sights. Since then, I began plotting what I wanted to do next time I visited: buy a bike and ride it through the streets of India without the guidance or safety that comes with pedaling with an organized group. Last week, in India, I had my shot. I figured this would be like one of those 'Top Gear' challenges, where Jeremy Clarkson, Richard Hammond and James May would buy a cheap car in an unfamiliar land and drive it an improbable distance while accumulating humiliation and laugher along the way. After all, I didn't have the budget or inclination to buy anything remotely state-of-the-art; I had already seen that the bikes on the road mostly shared four characteristics: they were big, they were study-looking, they had one speed and the brakes were set up with a series of metal rods and levers rather than cables - something that I imagine made them very reliable even if they contributed to what I was sure was tremendous weight. That picture was taken on my first visit to Delhi six years ago. It's one bike but I saw hundreds more like it on the street. That was the kind of bike I wanted. For this trip, we once again stayed at the remarkably comfortable hotel Leela Kempinski in Gurgaon, just beyond the toll plaza on National Highway 8. This trip, we discovered the hotel offered an hour long yoga class every day at 5:30pm, and I decided to take advantage of it as often as I could since I was missing Exhale in Stamford. Our visit was to be five days, and I decided to try my luck the first full one to find a bike I could buy and use for the rest of my visit. After dining on Indian food at the food court at the Ambience Mall (I always steer clear of American chains when I go abroad) I rode in the back of a tuk-tuk through dusty streets to the Sikandarpur train station, reasoning that the busy area could yield me a place to buy a bike. The whole time I walked I studied the traffic as best I could, and my initial assessment was that if I did choose to ride here, it would, at best, be an organized free-for-all. 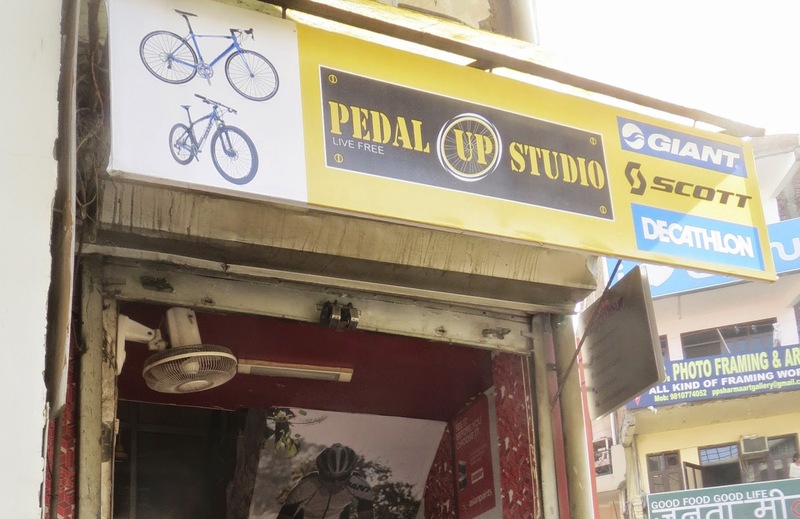 As it happened, I was very lucky to find a cycle shop almost right away: after wandering through several stalls of metal fabricators, with my fascination bordering on envy, I turned right on a street that ran under the elevated track and entered Pedal Up Studio. I met the owner and spent some time in his very nice shop, which, unlike most American bike stores, contained a well-curated selection of road, hybrid and mountain bikes rather than scores of them jammed together. But none of these were the 'working class' variety of bikes I was looking for, so I instead bought a healthy snack, thanked him, and continued on my way. Barely ten minutes later, when I had dodged tuk-tuks and motorcycles to cross the street, I couldn't believe my luck. A few minutes with one of the employees here made me realize I was in the right place: the shop sold both the Hercules and the Atlas, the latter of which was listed at 3,750 Rupees, or about $62.50 U.S. Because it was late Monday and the shop would be closed the next day, I decided it was now or never and told the man I wanted to buy the Atlas. It was exciting to watch them unwrap the bike from its cardboard and plastic confines, fit a seat, and accept my money (all of which had been sitting in a desk drawer in my house for the past two years since my first attempt to buy a bike during my 2012 visit was unsuccessful) and send me on my way. I drew stares from the group when I pulled out my own helmet. As you know, I almost never travel without it and was sure that the busy streets of the area would make me appreciate a little cranial protection - and the helmet-mounted rearview mirror. I mounted up and the excitement of owning a new bike in an interesting place was immediately tempered by my realization of just how heavy the bike was: 28.5" wheels, steel frame, steel fenders, steel chaingaurd, steel rear rack and steel motorcycle-style kickstand. The bell was steel, too, and it was loud enough to knock the earth from its axis. I pedaled off. The acceleration was slow to say the least and the cruising speed didn't feel fast, but for whatever reason it blended in to the Gurgaon traffic. I couldn't say the same for me, since I tended to draw occasional stares. It may have been the helmet. That first day, I went at least three miles just working my way (often incorrectly) back to the hotel. So focused on not being hit by various vehicles, I realized that upon my return I was still not 100% sure what side of the road people drove on in India. It wasn't uncommon to see tuk-tuks, cycle rickshaws and bicycles riding the wrong way along the edge of the road that feeds out from the mall. Since at the time I wasn't sure how to ride with traffic and turn right into the hotel, I elected to ride along the edge as well. This, believe it or not, was the only time this first day I pulled out the camera to take a picture. The rest of the time I was too busy gripping the handlebars. The hotel staffer who controlled access to one of the gates leading into the hotel recognized me from earlier and, clearly not expecting me to return with a bicycle, stopped me from entering and spoke for a minute or two into a walkie-talkie before directing me to the other side of the ramp, where two other employees (always the nicest people) told me to park the bike among the cars under the ramp, and they assured me it would be safe there. It was only then I was able to take a good look at what I had paid $62.50 for. As heavy as it was, I had bought myself a thing of beauty. How could I not admire the way it was made? The linkage for the brakes was by far the most fascinating bit. As I had written before, this isn't found on U.S. bikes, and my most intelligent guess is the design is decades old. The three mile trip back to the hotel told me the brakes were reliable, and I never got tired looking at the levers and rods that made it all work. This bike also came with its own integrated wheel lock. Every bike I had seen in India had one of these, and I couldn't remember ever seeing any bike locked to anything. So here was a lock, and I had my own keys, which made the realization of ownership really sink in. As I said, the people who were working the main entrance to the hotel were among the nicest people I met and were sincere in their assurance the bike would be safe, but just to make it a little more difficult for the bike to be stolen I wove the cable lock I brought with me through the frame, and I had it there each day the bike was locked up while the keys were in my pocket. I showered and changed for yoga class, where I met my fellow students - Yvonne and Debbie, who were both interested in how my cycling adventures would turn out - before bending my unbendable body into poses that helped me cope with jet lag. I did have trouble focusing since my mind was on the bike parked outside - and the fact that I'd be able to ride it for the next four days in Gurgaon and Delhi and really experience how this area bikes.